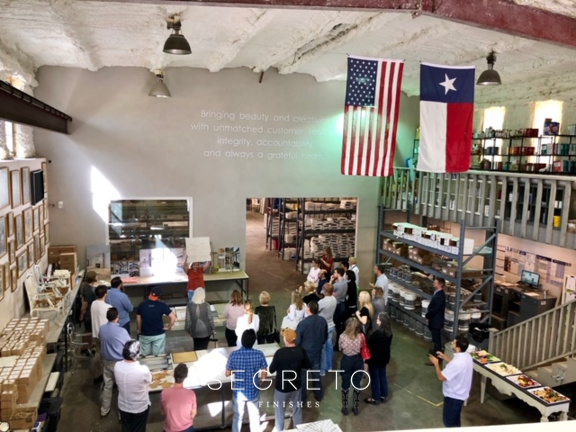 Warehouse-An Unlimited Space to Create! Hi Friends!! I love new beginnings and limitless imagination. This quote sums it up! 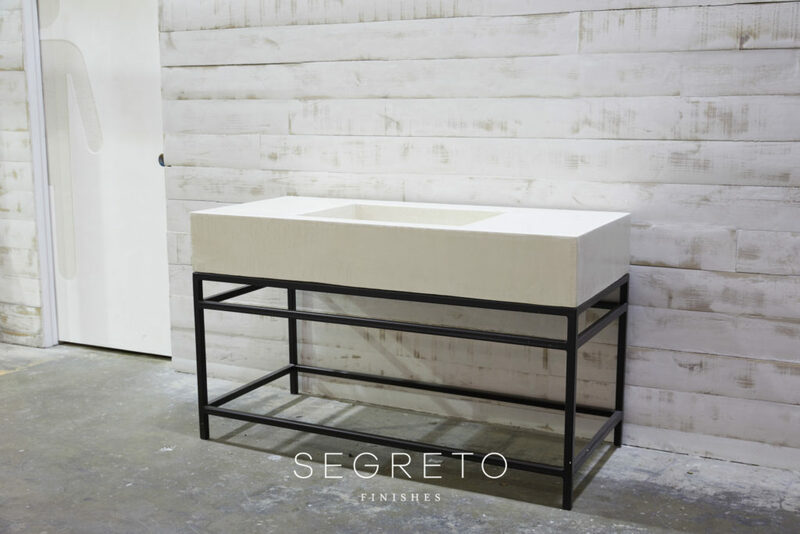 This is what the warehouse purchase has meant for me, Segreto and you!! Even though little Charlotte loved her daddy’s (Isai’s) new office space as it was when we purchased it, we have made it much much prettier now! 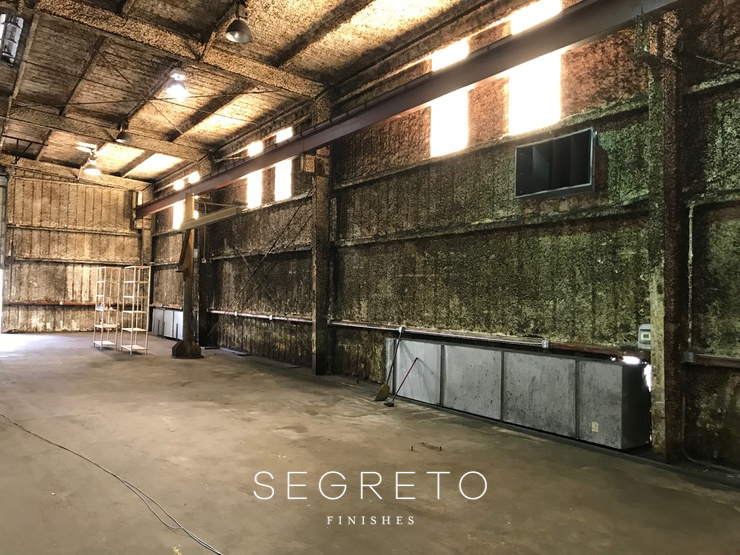 Officially starting Segreto in 1995, I had no idea that we would ever need a space with oodles of room where we could refinish furniture, build our sinks and counters and just be able to create. 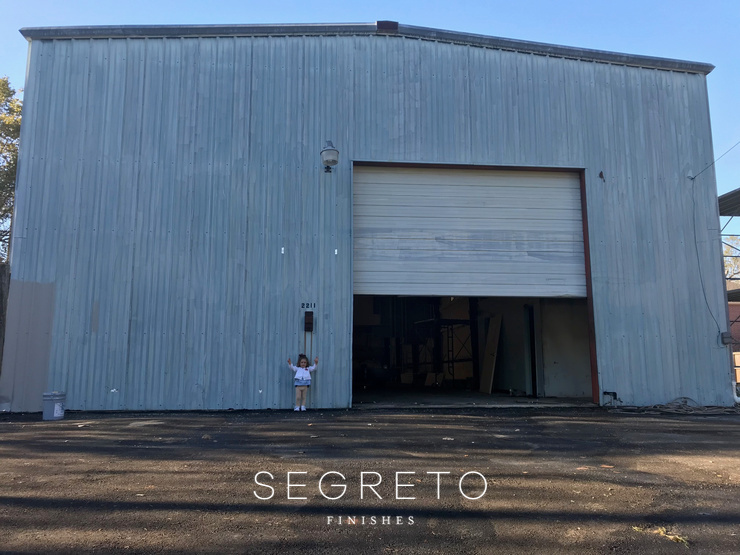 Starting in my garage, then renting a small office storage space, to buying and remodeling two tiny homes to this “BIG WAREHOUSE, the transitions show that dreams definitely can come true and grow! In it’s previous life it was a machine shop and the walls were filled with grease. 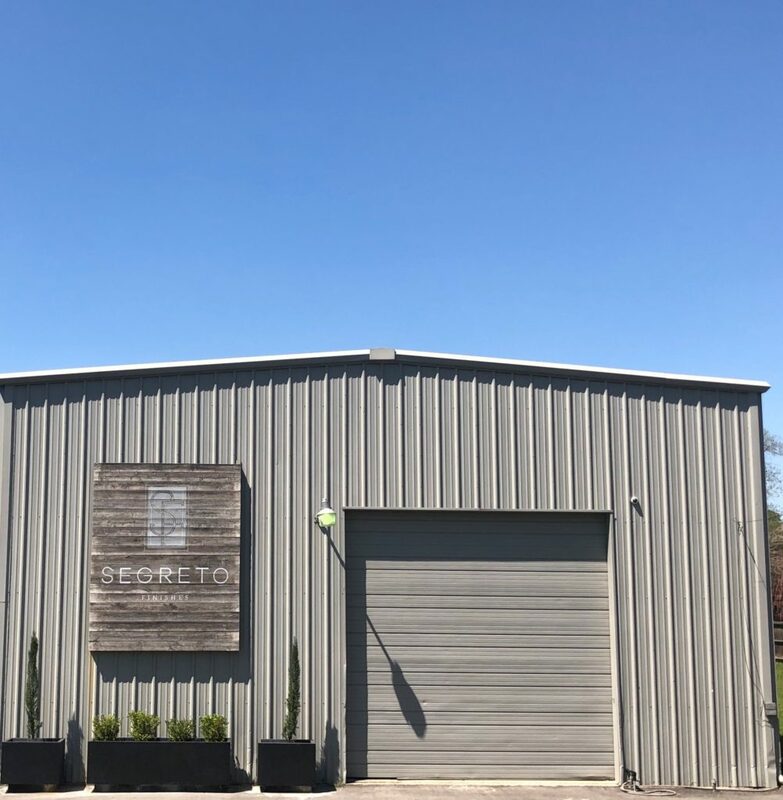 It is 6,000 square ft building on an acre of land. My hope one day is to build offices on the property, so both design and operations can be in one place. 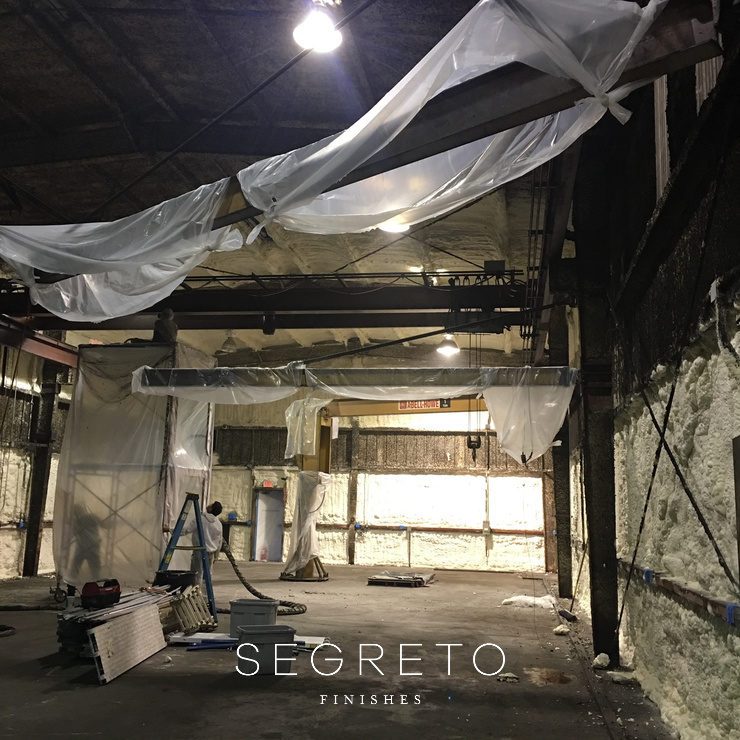 But to start, we are so excited to transform this into a showroom and work space. We cleaned the walls and reapplied foam insulation to fill holes and hopefully reducing the air-conditioning bill. What I didn’t know is that this insulation turns mustard yellow really fast! So, the front half of the building where we have more visitors was painted and the back working area left as is to amber over time. That budget thing!! This is from the back of the building looking towards the front garage doors. 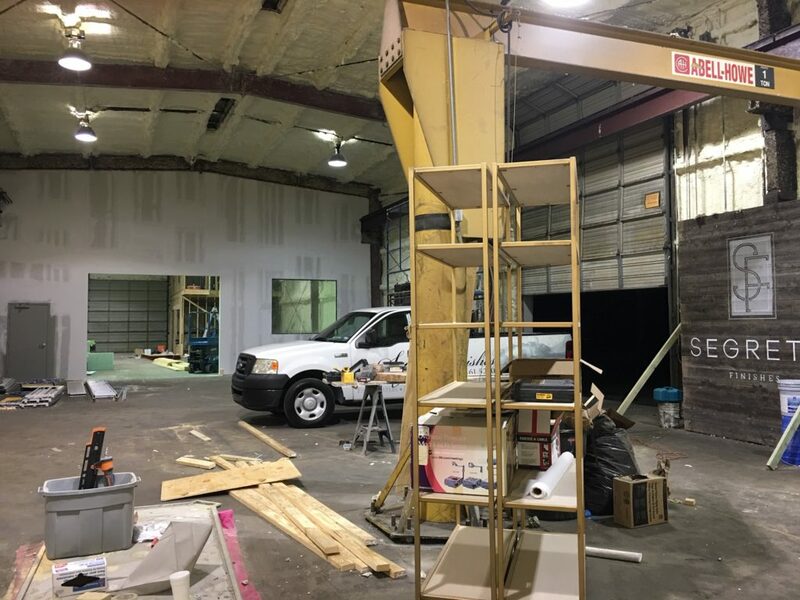 We put up a wall to divide the clean working areas like furniture refinishing, storing supplies, paint, office and bathroom spaces. You can see at the front we are building a building within the building for offices and showroom. The sign, to the right, has our logo hand painted on some outdoor fencing we had taken down. 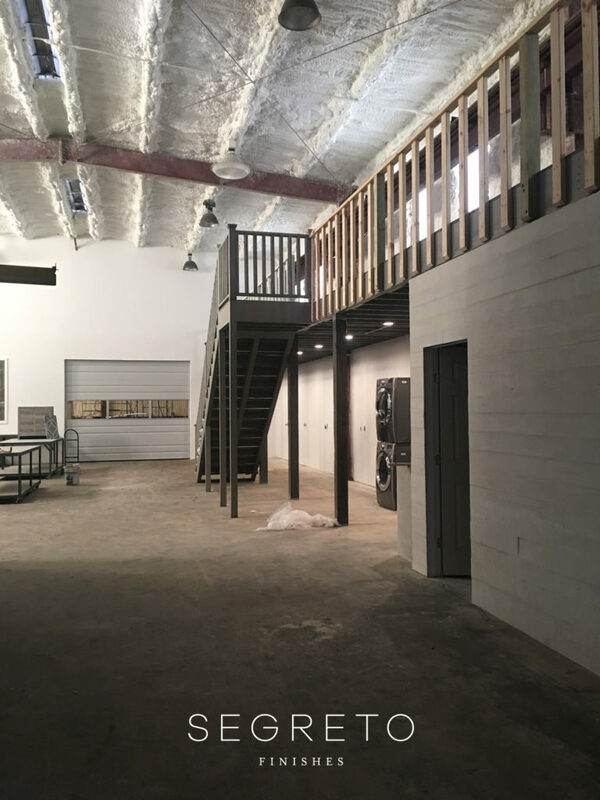 We built a two story structure lining the right of the building–the bottom floors have his and her bathrooms, a kitchenette and a station to mix paint. The top floor stores the books and all of our supplies. Wish I could have afforded an elevator–oh well, at least we are getting our steps in! On the other side there is a staging room for furniture below and offices above. Look at the amazing steel windows we got from ACI Metal Works!! 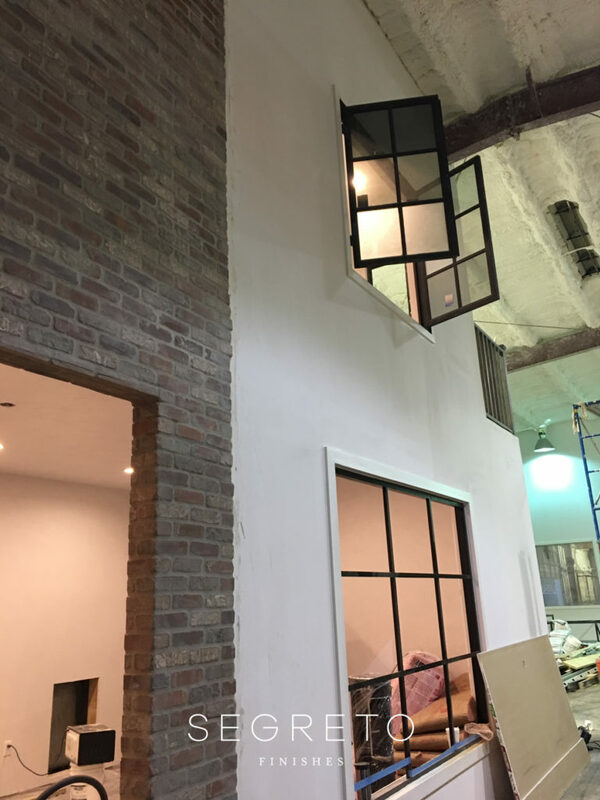 It really looks like a home now since we have plastered the exterior walls and lime washed the brick! 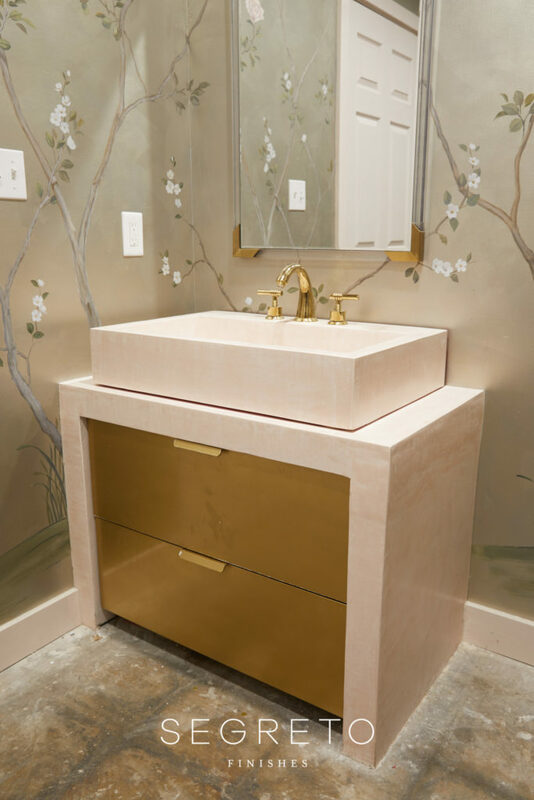 The girl’s bath has a Segretostone waterfall basin topped with a vessel sink and a hand-painted floral design on the walls! Here are those IKEA drawers again painted like brass. Floors next!!! 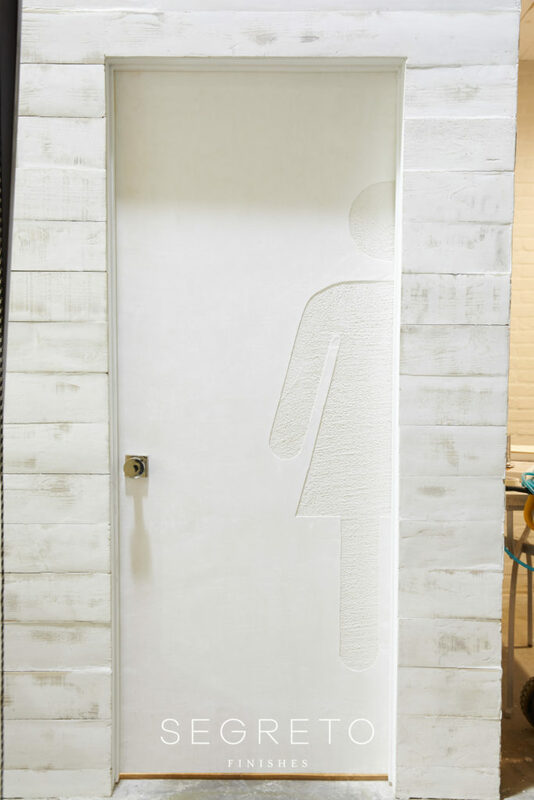 Here are the walls in the men’s bath!! They got a soft gray plaster with a stencil pattern in a metallic. They needed to feel special too!! 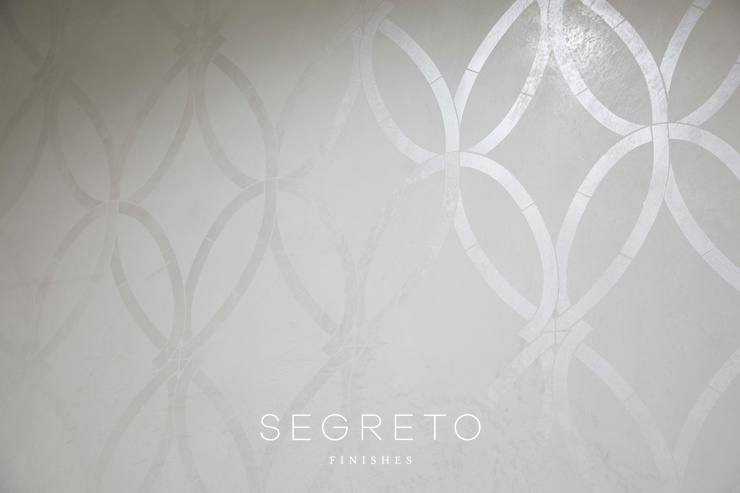 a his and her motif was created on top of the wood doors to each bath with SegretoStone. A world of possibilities!! 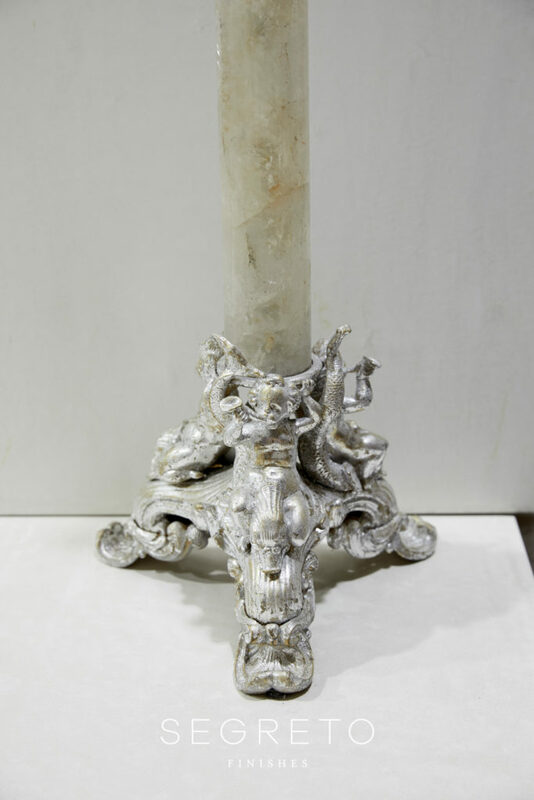 We now have space to silver leaf lamps…..
age new doors to read old…. 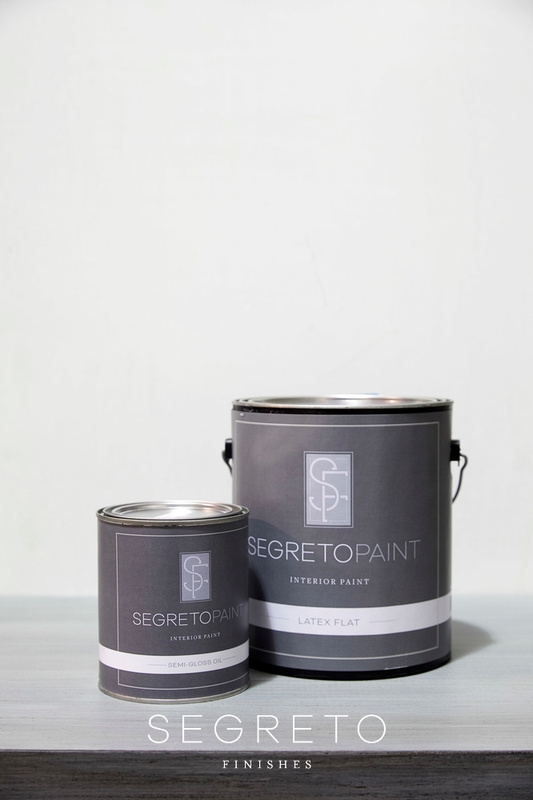 We also have room for another dream of mine… our own Segreto Paint enables us to offer lovely colors at affordable prices and to be able to create signature colors individualized for every client. We have hosted few things here for groups who called. We hope to do much more of this in the future to share our world of possibilities with you!! I want to thank each of you for your loyal support and friendship during our ever evolving journey!! Friends are the family you choose. Let yours know how much they mean to you! So friends, you mean a lot to me! I am forever grateful for all who all who have allowed me to create and constantly inspired me to always imagine new possibilities!! 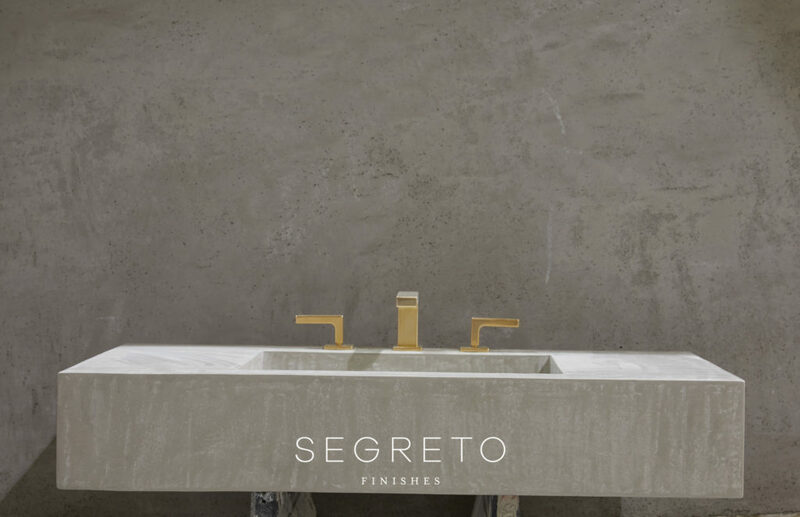 << I Am Now an IKEA Hack-Segreto's Updated Showroom! You always bring hope and inspiration to the rest of us who are also on our way to unless possibilities. 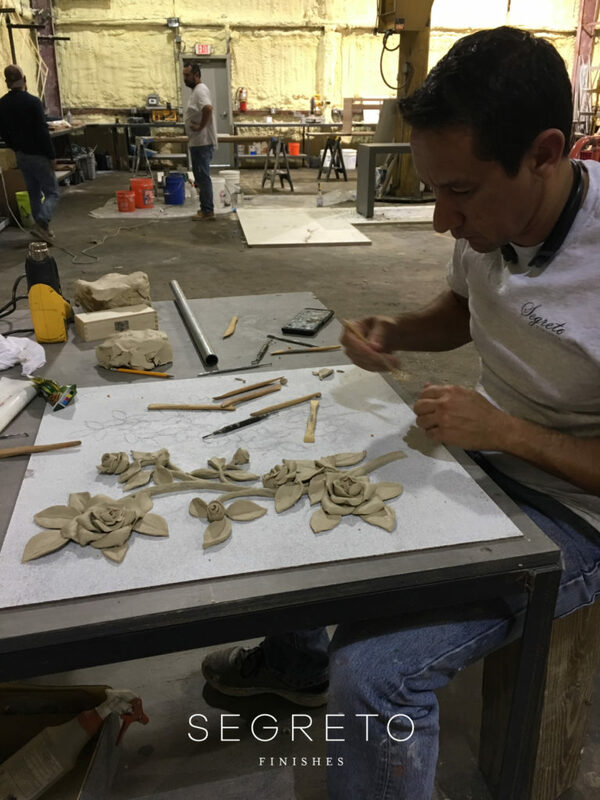 Great job transforming an industrial space with your many talents. I wish I could transform it more!! It is a working space though!! Hi Candis!! Thank you so much!! We are loving it!! Can’t wait to share more that is in store!! Congratulations! 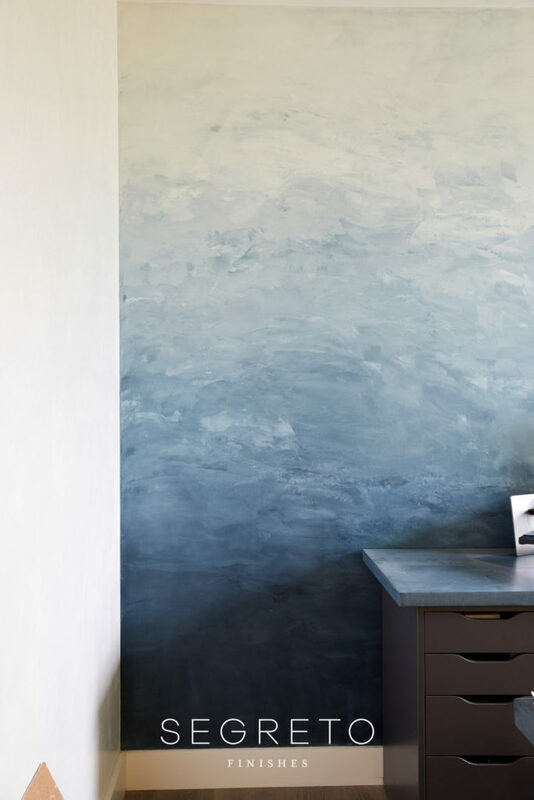 What a fabulous work space! Onward and upward to even more greatness! 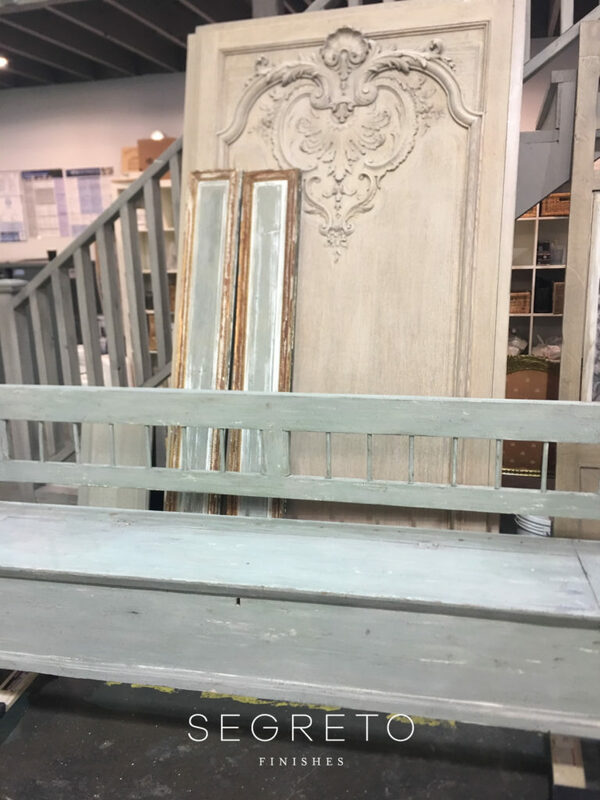 Hi Leslie – it’s been really fun to read your blog and hear about all the exciting changes in your office and the warehouse! Hi AnnaLee! !I am so glad you are following along!! I hope all is well with you, you always have so much on your plate!! Happy Spring!! Congratulations once more, I enjoyed learning of you’re warehouse journey, undoubtedly a creative environment . Your vision and energy is inspiring. I love your new home and the amazing projects! Wow, amazing work and beautiful space! 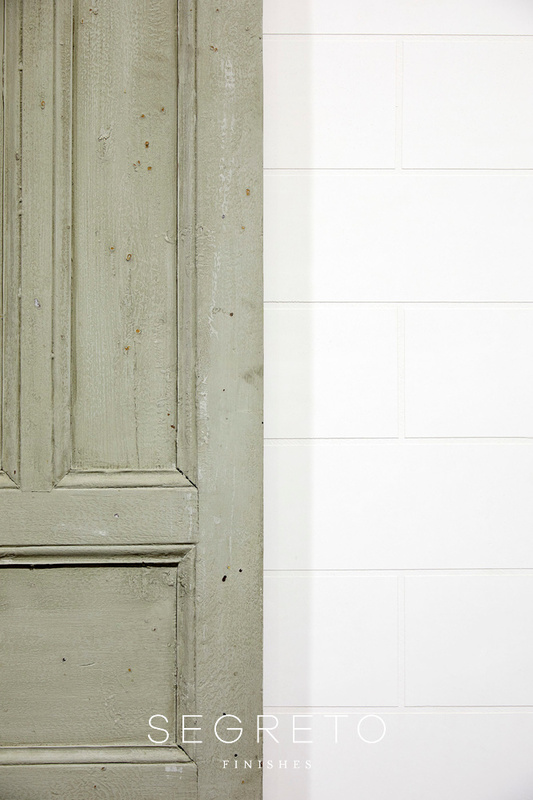 Love the doors, windows, sinks, silverleaf. Three questions. Can you add metal doors (to create storage) to the sink bases? Can a “regular” person try/attempt to replicate that fabulous brass look on the Ikea pieces? How do you paint the insulation (or this best left to professionals)? Hi KJ-Yes you can add storage. The design might be different. Honestly with those doors we primed them and painted them with a gold metal metallic paint we purchased from home depot! You certainly can do it yourself!! Go for it!! Hi Annie!! Can’t wait for you to visit! !